Early in She Rises (Bloomsbury), Kate Worsley’s debut novel, Louise Fletcher, a young dairy maid on an Essex farm, describes the process of hand-churning butter: “If I squeezed too hard it would split and slide apart….So I would hold it lightly, like you’d hold a living thing.” It is, perhaps, one of the few idyllic moments in this highly charged historical novel, but it is also an apt metaphor for the story. Hold it carefully, for as the cream tosses within its pages, something fragile and necessary forms. Louise soon leaves the Essex farm where she’s been raised for the port town of Harwich, having been drawn into service as a lady’s maid for the daughter of a smuggler. Timid, yet captivated by this new world, Louise’s life is quickly turned upside down by city life and the deepening bond between herself and her lady, Rebecca. Woven alongside Louise’s tale is Luke’s, a young sailor press-ganged into service for His Majesty’s Navy. Aboard the warship Essex, Luke struggles to learn a way of life utterly foreign to him—a life of brutal hardships and heavy drinking, rife with danger at every turn. His survival is a matter of wise choices and secret-keeping. This twinning of tales is very obviously moving toward collision—there’s a connection brewing, even if the reader isn’t quite sure what—and that’s enough to keep you turning the pages, but the pacing in the first half of the book is a little slow. The alternating chapters, while necessary for the storyline, make it tough to fully drop into either narration. Louise and Rebecca’s love story is illicit, enticing and achingly honest—Louise says, of the night she accompanies Rebecca to a masquerade, “I put the black felt half-mask to my eyes. It was like pressing a blackbird’s wing to my face. I felt myself inside a dark tunnel, the world narrowed so all I could see was you.” But it’s a fine line to walk, and it occasionally leans toward melodrama. All that said, Worsley’s language, her deft ear and turns-of-phrase, her vivid descriptions of life aboard the Essex and in Harwich, are wonderful to read. And when Louise and Luke’s stories finally collide—well, that’s where the magic is. I’m not going to give it away, but I’ll say that it is done with absolute skill and a brave hand, and from there, the story propels itself, racing toward the conclusion. 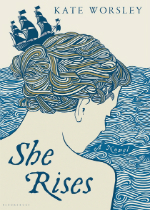 She Rises, in all its 1740, Georgian England rigging, is essentially a story of escape, of discovery, of transcending boundaries; it’s a coming-of-age story, and at its core, a multi-faceted love story. It is a very human story—it’s clear that Worsley has great affection for her characters, society outcasts that they are—and She Rises explores concerns that we still struggle with today. An intriguing, well-written debut that will please historical fiction fans, especially those interested in what constructs of gender have looked like in the past.